LotFP: RPG: Free RPG Day: This Saturday June 21st! LotFP is Participating! Free RPG Day: This Saturday June 21st! LotFP is Participating! This Friday is Free RPG Day, where you can go into a participating game store and get brand new RPG stuff at no cost to you. A list of participating publishers is here. A retailer locator to find the nearest participating location is here. 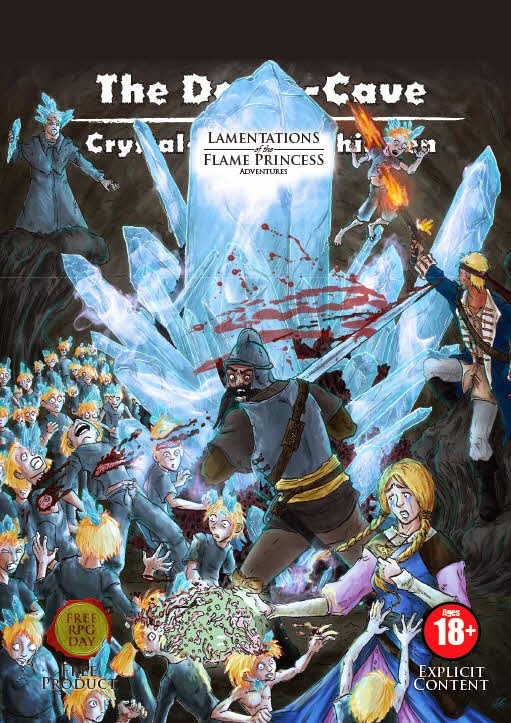 LotFP's free adventure this year will be The Doom-Cave of the Crystal-Headed Children, a strange little 36 page dungeon adventure designed to confound and amaze. So go down to your local game store and pick up a copy and buy something or two from the store - it's why they pay money to get the free stuff to draw you in the door.